^ Kroeber Anthropological Society: "Neandertals: Unique from humans, or uniquely human?" ^ Tattersall I, Schwartz JH (June 1999). “Hominids and hybrids: the place of Neanderthals in human evolution”. 米国科学アカデミー紀要 96 (13): 7117–9. doi:10.1073/pnas.96.13.7117. PMC: 33580. PMID 10377375. http://www.pnas.org/cgi/pmidlookup?view=long&pmid=10377375 2009年5月17日閲覧。. ^ コパン 2002, p. 94. ^ コパン 2002, p. 95. ^ Laleuza-Fox, Carles; Holger Römpler et al. (2007-10-25). “A Melanocortin 1 Receptor Allele Suggests Varying Pigmentation Among Neanderthals”. Science 318: 1453. doi:10.1126/science.1147417. PMID 17962522. ^ Pathou-Mathis M (2000). 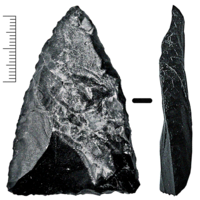 “Neanderthal subsistence behaviours in Europe”. International Journal of Osteoarchaeology 10: 379–395. doi:[[doi:10.1002%2F1099-1212%28200009%2F10%2910%3A5%3C379%3A%3AAID-OA558%3E3.0.CO%3B2-4|10.1002/1099-1212(200009/10)10:5<379::AID-OA558>3.0.CO;2-4]]. ^ Templeton, AR (2002). “Out of Africa again and again”. Nature 416 (6876): 45–51. doi:10.1038/416045a. PMID 11882887. ^ Green, Re; Malaspinas, As; Krause, J; Briggs, Aw; Johnson, Pl; Uhler, C; Meyer, M; Good, Jm; Maricic, T; Stenzel, U; Prüfer, K; Siebauer, M; Burbano, Ha; Ronan, M; Rothberg, Jm; Egholm, M; Rudan, P; Brajković, D; Kućan, Z; Gusić, I; Wikström, M; Laakkonen, L; Kelso, J; Slatkin, M; Pääbo, S (August 2008). “A complete Neandertal mitochondrial genome sequence determined by high-throughput sequencing.”. Cell 134 (3): 416–26. doi:10.1016/j.cell.2008.06.021. ISSN 0092-8674. PMC: 2602844. PMID 18692465. https://www.ncbi.nlm.nih.gov/pmc/articles/PMC2602844/. ^ a b “ネアンデルタール人は火山噴火で絶滅?”. National Geographic 日本版. (2010年9月24日). http://natgeo.nikkeibp.co.jp/nng/article/news/14/3165/?ST=m_news. "...ナポリ近郊で発生した“カンパニアン・イグニンブライト噴火 (Campanian Ignimbrite eruption)”の時期に当たる火山灰が最も豊富な層は、樹木花粉が存在せず、植物の花粉もほとんどない不毛な地層だった。...当時のヨーロッパには現生人類の小集団も住んでいたので、噴火の影響を同様に受けたと考えられる。だが、ネアンデルタール人のほとんどがヨーロッパに居住していたのに対し、現生人類はアフリカやアジアにより大きな人口を抱えていたため絶滅を避けられたようだ。"
^ msn ニュース、2014年10月25日閲覧。 Archived 2015年5月21日, at the Wayback Machine.